ON THIS SOUTH PACIFIC TRIP LU WAS 6 YEARS OLD. 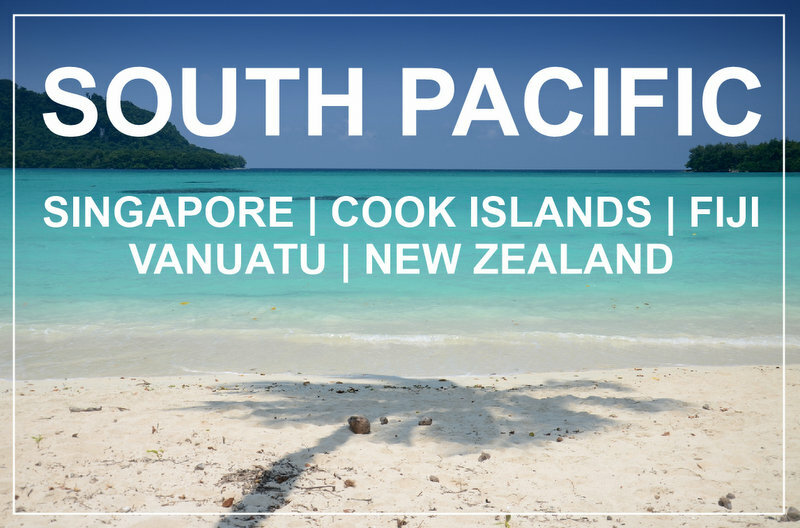 MORE POSTS ABOUT SOUTH PACIFIC WITH KIDS ARE COMING UP SOON. From Munich we flew to Singapore with SINGAPORE AIRLINES, which again, were awesome. 11 HOURS FLIGHT was an easy one. Starting with a good movie, a sleeping child and a glass of Cabernet. Cheers to holidays! The liberating FEELING OF FREEDOM kicked in already in the plane but even more at CHANGI AIRPORT when we put on our flip flops. After about an hour in the annoyingly freezing MRT TRAIN ride (hello crazy Asian AC) to the centre we were hit by the hot humid air the moment we stepped outside at the Farrer Park station. Oh ASIA, it was so good to be back! Especially coming from snowy cold Europe in January. It was MY 4th AND LU´s 3rd TIME IN THE CITY, so we basically didn´t feel the need to visit the tourist sites or museums this time. We just enjoyed its streets, parks, playgrounds and food markets. Wandering through the lively streets of Little India, chilling at Gardens by the Bay, cooling off at water playgrounds, shaking off the jet lag by the swimming pool and just eating as much delicious food as we could. I just love this city. 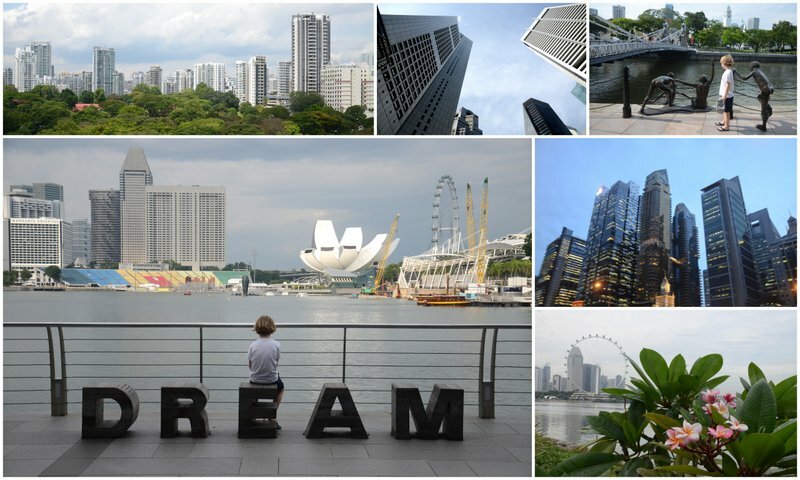 Lucky us, we have FAMILY IN SINGAPORE, so we always make deliberate stops for a couple of days when we ravel to this side of the world. Thanks to my cousin and his girlfriend we had a perfect start of this Pacific trip. We just got used to the TIME CHANGE and we had to move again. Not that we were complaining, after all we had a great place to visit next. The MOM & SON TRAVEL ADVENTURE was going excellent so far and Lu was behaving at his best. The way to RAROTONGA was long though. Another 10 HOURS ON A PLANE, this time with AIR NEW ZEALAND. Landing in AUCKLAND in the evening, we decided to SPEND THE NIGHT AT THE AIRPORT. Being here before, I knew the airport hotels are quite expensive and our next flight was in the morning anyway so going to the city was not an option. So, there we were, trying to find at least a semi-comfortable position at the bar on the first floor. Not the easiest 8 hours, but we made it! And saved some money. Finally BOARDING. Airplane BREAKFAST yay. Eggs. Again. And coffee. Lots of it. We were in almost desperate need of a shower but oh well, it´s all part of the adventure. 3 hours later there we were. Filled with excitement, we forgot about how tired we actually were once we were reunited with one of my BEST FRIENDS, her hubby and baby. Needless to mention we went straight to the beach to have a BEER AND A SWIM after they picked us up at the airport, right? KIA ORANA Rarotonga! 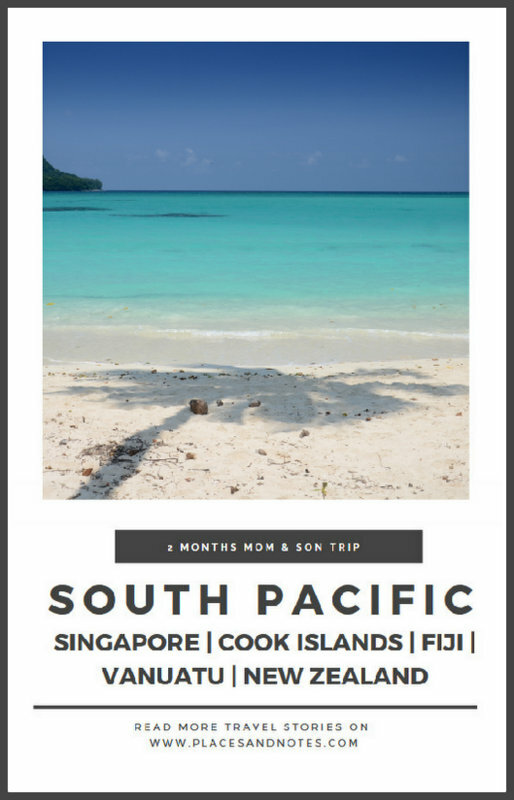 We have been to COOK ISLANDS in the WINTER OF 2017 (at that time still as a family of 3), but we only stopped at Rarotonga for 2 days, because we spend the most time on AITUTAKI. This year, Lu and me had almost 2 WEEKS. What can I say, it is a paradise. It is great to be able to experience the island life the way local people live it. After a long time, we were NOT REALLY LIMITED WITH HOLIDAY DAYS. And we didn´t have to hurry in order to see everything. Instead, WE TOOK IT EASY . We had BBQs at home, did some gardening, watched TV, did the shopping, went to the market, met a bunch of new people, swam and snorkelled, been to lots of nice bars and restaurants, driven a few amazing back roads and bought some local products & light clothes for the next weeks. Somewhere halfway through the FLIGHT BACK TO AUCKLAND it hit me – we are all alone from now on. No more visiting friends and family on this trip, no more convenient pick ups at the airport. Just me and Lu. On the way to Fiji. With one 42L backpack. And no accommodation booked. AUCKLAND airport. Ahhh free WIFI and finally MOBILE PHONE SIGNAL. I did not have a network anywhere on the Pacific islands. A tasty LUNCH with a glass of good NZ WINE, assuming I will not be getting much of that in the next weeks. Expensive. But worth the money at that moment. Urgh. NEXT FLIGHT. This time the connection time was not too long. 3 hours later touch down in NADI. Tired and hungry we exchanged some money and grabbed one of the airport hotel shuttles. In pouring rain. The plan was to spend one night CLOSE TO THE AIRPORT in case we decided to fly out to one of the ISLANDS the next day. Yay, they had a free room. A little house actually. With a terrace. Dinnertime, with a cold beer. Fiji Gold. Ok we are staying 2 NIGHTS, to get a feeling of this new country and make a plan where to go next. The hotel had a POOL, with a slide, so the child was busy the whole next day. And me, I did some research and decided to hop some of the YASAWA ISLANDS for the next 2 WEEKS. Arranged the boat tickets and the transfer to the harbour in DENARAU, close to Nadi. Nadi on its own is nothing really special. Just like a normal busy town, we took a taxi to the center and bought some water, food & snacks, stopped at an ATM and that was pretty much it. DENARAU on the other hand, was puuuh. Very nice big hotels, a golf place, posh cars. What a contrast. 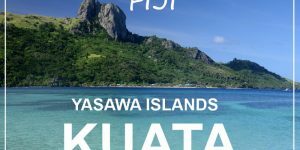 We booked the tickets for the YASAWA FLYER BOAT. It is kind of a CHARTER BOAT that drops off and collects passengers on various islands. It seemed like the easiest way to get around there. On the way to our first island we passed the MAMANUCA ISLANDS GROUP. That looked just fabulous really. I´d say the accommodation there is most probably in the higher price range, so it was out of our league this time. 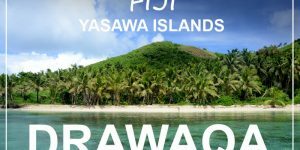 Instead we sailed onwards to the YASAWA ISLANDS. CAST AWAY and the BLUE LAGOON movies were shot around here. After quite a few stops on the way we reached the doc at DRAWAQA ISLAND where we stayed at the only place on the island, the BAREFOOT MANTA. We rented a small and very basic but comfortable BURE (a wood-and-straw hut,) at the beach. Our days on the island were as lazy as they could be. We snorkelled, hiked to the top of the highest hill for the best views, made new friends, ate fresh coconuts every day and fell asleep with the sound of the waves. We also took a DAY BOAT TRIP to one of the neighbouring islands and visited a VILLAGE and a SCHOOL one day. The good thing about these resorts is that they are usually kept small and you get to easily interact with the other guests, but there is still enough space for everyone to enjoy their privacy. A couple of days later our new local friends brought us to the big yellow fast boat which was waiting in the middle of the bay for passengers and we were off to our NEXT ISLAND. There are so many islands and resorts that it was actually not so easy to choose where to stay. We decided for MATACAWALEVU because there was this place called WAITUI BASECAMP with these great TENTS to stay at. 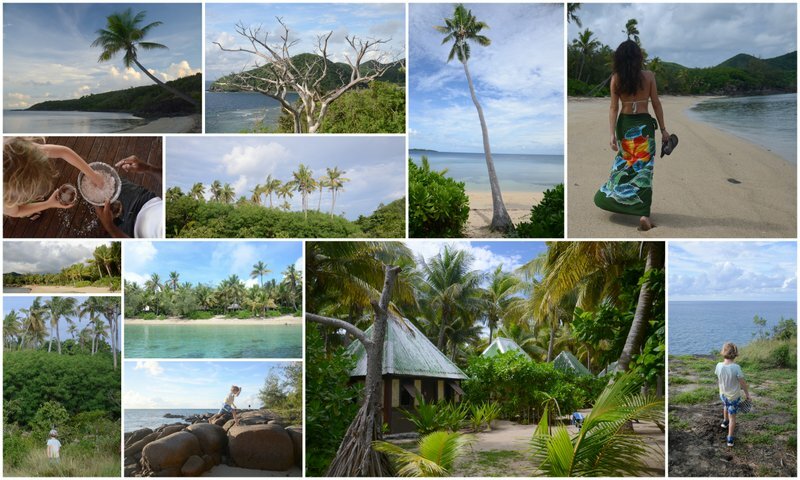 This was also our CHEAPEST ACCOMMODATION on the Yasawa islands, for around 50€ a night, but it was not lacking any luxury for us. 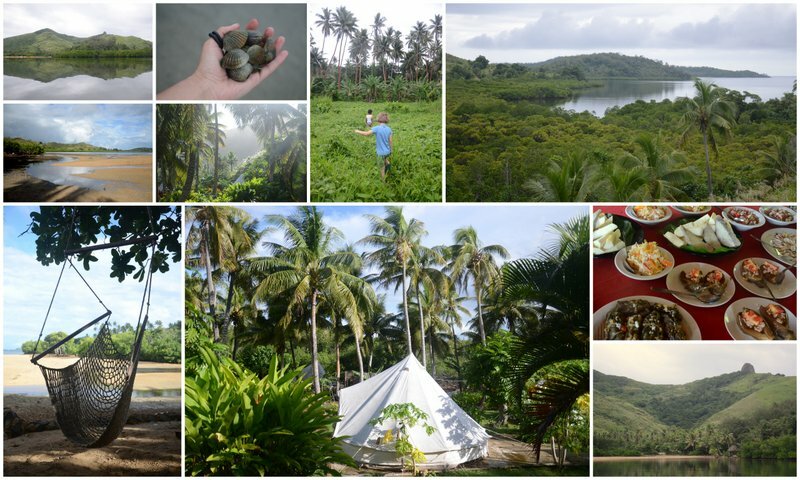 Comfy bed, in the middle of nature, open air shared shower, decent food and friendly owners. There was not much to do otherwise, so we were hanging out with the other few travellers, played some VOLLEYBALL, chilled in HAMMOCKS, collected CLAMS for dinner, went for WALKS and read BOOKS. 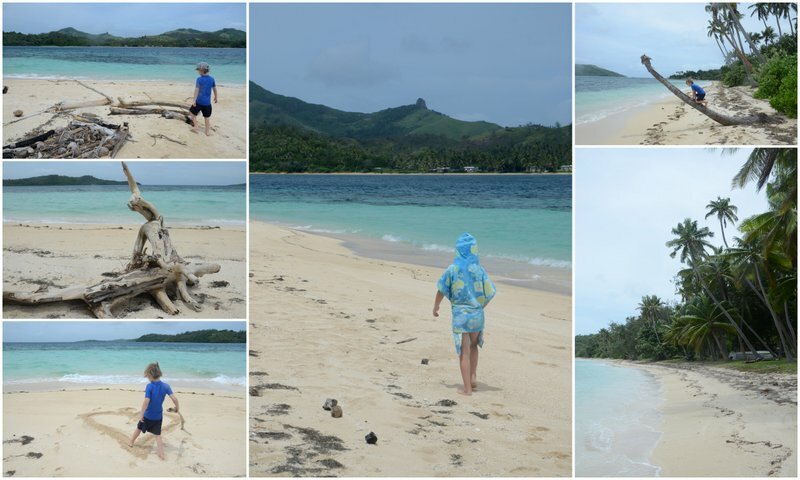 The beach was not so spectacular on MATACAWALEVU as it was more of a MANGROVE BAY, so we hopped on a boat to the neighbouring NANUYA LAILAI island one day, just TO SWIM AND SNORKEL a bit. All in all, this was a great place to get away from it all and simply do nothing but chill. The next stretch of boat travel was a long one and it took us almost the whole day. First north to the NACULA ISLAND with the famous BLUE LAGOON RESORT (the Blue Lagoon movie was filmed here around). This is also the last, MOST NORTHERN ISLAND with a resort on it. From here it was all the way down to KUATA ISLAND, where we stayed at BAREFOOT KUATA. We knew this was OUR LAST ISLAND ON THE YASAWAS so we went all in. Mom went swimming with REEF SHARKS. Yikes, all went well, but they were bigger than expected. Lu met some fun new friends his age from Austria. They were inseparable for a while. Mom was up to see the SUNRISE with a cup of coffee every morning and had a COCKTAIL every day at SUNSET. Basically, we both had a really great time and were a bit SAD TO LEAVE THIS PLACE. Anyhow, we already had plane tickets to VANUATU, so we had to go. It was not a long boat ride BACK TO THE MAINLAND but until the end, we were not sure if we can go on it. It was raining cats and dogs and there was a serious threat of a CYCLONE. Huh, luckily, we arrived safely back to NADI after a good shake-up in the stormy waves. We splurged on a pizza & beer with our new Austrian friends which also had a flight in the next days. We stayed at the same HOTEL CLOSE TO THE AIRPORT and spend the next day swimming in the rain. That was fun. But it was soon time to say yet another goodbye. Despite all the RAIN coming our way and the CYCLONE being upgraded to a higher number, we could FLY TO PORT VILA on EFATE island in VANUATU. Nadi airport was packed. So many flights, so many people. 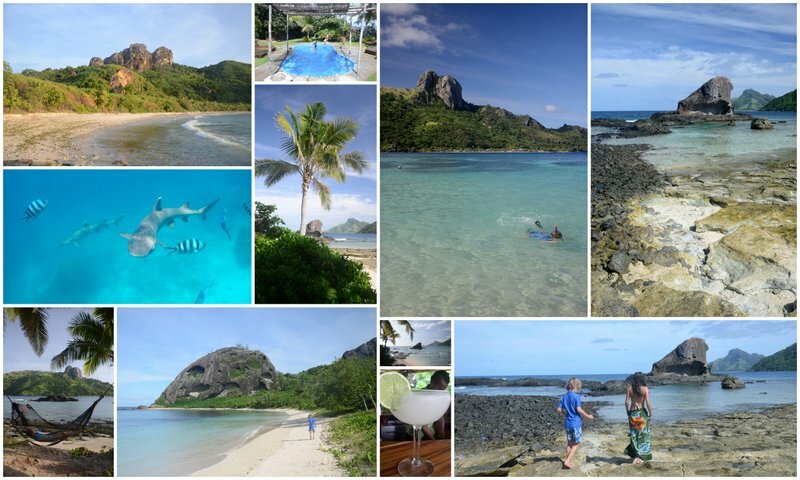 We flew FIJI AIRWAYS again and were two happy customers once we landed. Hooray, WE ARE IN VANUATU! I could not believe it somehow. There we were, Lu and me, in the middle of the ocean on some island I have never heard much about until a couple of months ago. All alone, in f***** Vanuatu! It felt really awesome and exciting to be able to be there with Lu. My phone also had no network the whole time, which just added that little extra to the adventure. 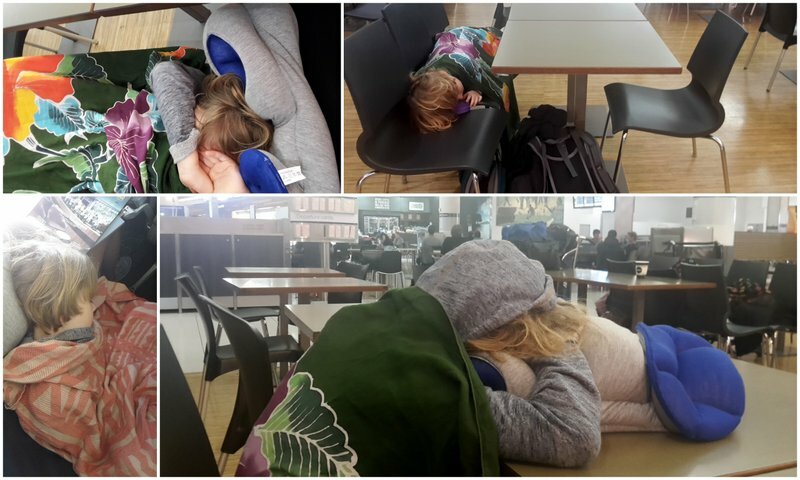 After waiting for our dirty backpack, which they brought from the plane and placed it on the floor next to the others and sweating in “line” for a shared taxi we drove through PORT VILA´s suburbs untill we reached our little GUEST HOUSE we booked a day before the flight. It had a little POOL. A friendly owner. And hot water in the shower. 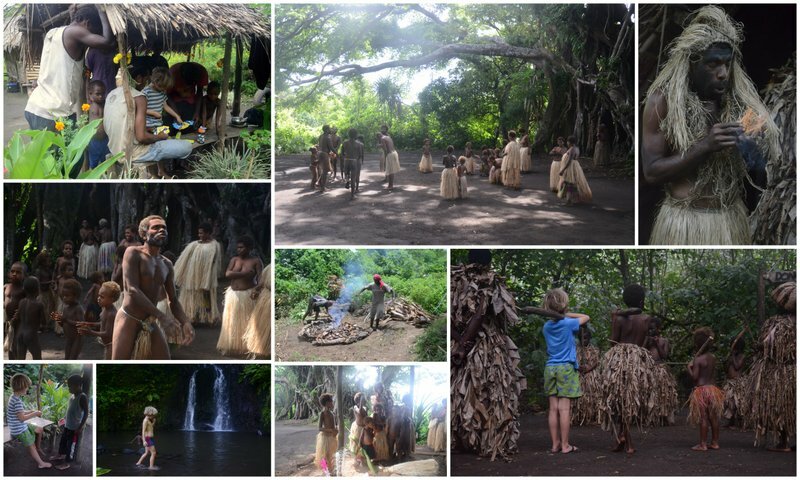 FIRST IMPRESSIONS OF VANUATU? Reminded me of Africa. Cannot really explain why, but that´s how it felt. People were different, architecture was different, food was different. The whole vibe was different. Even the tourists were different. It was exciting to be in a new, unknown place. We did not see much of the country´s capital, Port Vila, this time. We were soon off to TANNA ISLAND. 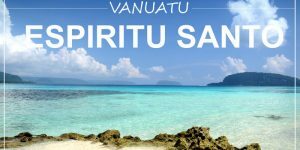 This time with AIR VANUATU. Yay or nay? Yay. Great flight, even though tiny scary plane. Urgh, not a fan of little planes here. Anyway. Landed safely on Tanna and straight to EVERGREEN RESORT. We booked our ACCOMMODATION a couple of days in advance, usually by directly contacting them and some over booking.com. Because there are sometimes not many places to stay at i really advice you to book ahead. This resort was more pricey than what we usually paid but hey, we felt like it. 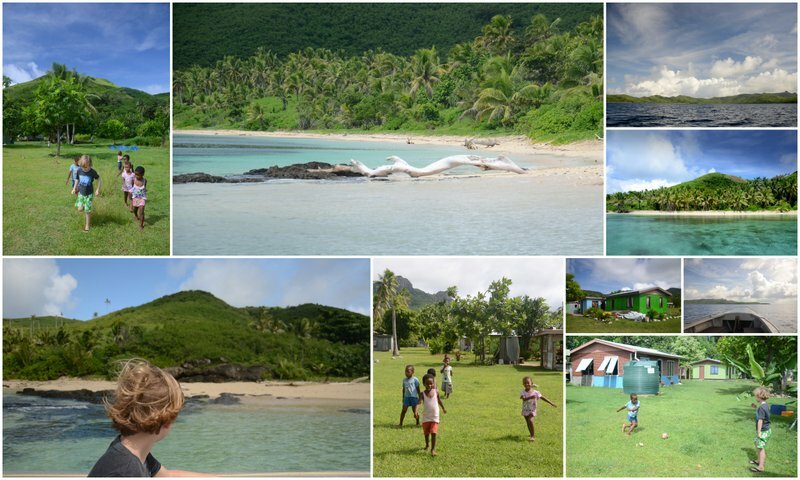 We spent some very PEACEFUL DAYS here on Tanna, but also a couple very ADVENTUROUS ones. 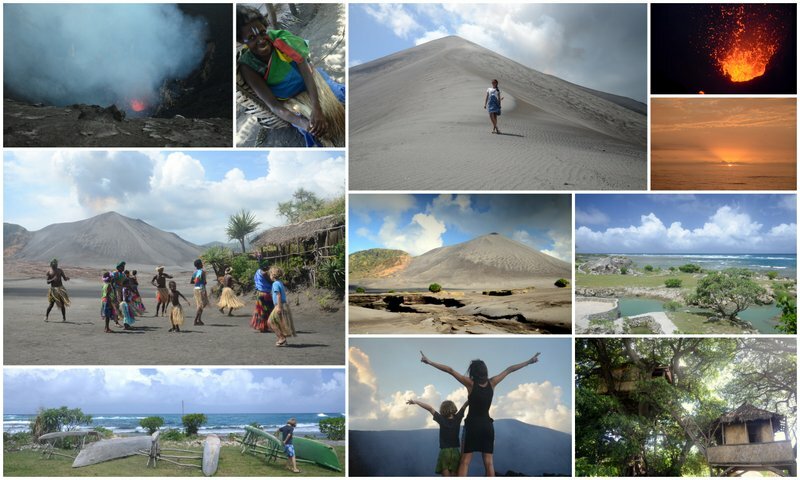 The whole purpose of going to Tanna was to climb the famous ACTIVE VOLCANO, Mt.YASSUR. Which we did. And it was truly incredible. Waiting for the sun to set on the ridge of exploding hot LAVA with just 10 other people was ONE OF THE HIGHLIGHTS of this whole trip. And seeing the excitement (okay okay also a bit of fear) in Lu´s eyes was just as rewarding. But that was not the only daring thing we did. We decided to SLEEP OVER at a LOCAL VILLAGE. In the jungle basically. Where nobody spoke any English. We did not have a mobile phone signal. Heck, there was not even a working mobile phone in the whole village I believe. This was by far the most AUTHENTIC EXPERIENCE we had on the whole trip. Days filled up with teaching the KIDS the Uno card game, peeing in an open air squat toilet, barefoot JUNGLE TREKKS with the village boys, WATERFALL showers, DANCING and trying to SING, CLIMBING up trees, COOKING and just trying to be a part of their daily life without disturbing them too much. PEOPLE HERE ARE QUITE SHY. Especially women. And you will need to gain their trust. They are not used to tourists and some of them have never even seen one yet. It did help that I had Lu though, we were well taken care of. And even if they really could not understand how and why and what am I doing with this small blond boy so far away from home, especially all alone with no man around, they accepted us amongst their COMMUNITY and made us feel like we have a huge new family for a couple of days. We had to first fly to PORT VILA on EFATE and then take another flight to LUGANVILLE on EXPIRITU SANTO island in the north. 2 small planes and we were there. Walked around Luganville for a while, did some SHOPPING, found a PLAYGROUND for Lu and a RESTAURANT for our lunch. Drove to explore the famous MILION DOLLAR POINT and grabbed a taxi to the north of the island in the afternoon. There where the best BEACHES are. Here, we were staying in a TENT. in PORT OLRY. For just 19€ a night with breakfast. On the beach. With the best morning view ever. And we were almost alone. What a LUXURY. No need for fancy hotels with pools and posh restaurants. Although that also feels good sometimes. But not here and not now. Here, we were totally happy to have our piece of PARADISE WILDERNESS all to ourselves. Just look at the pictures. I mean, do I need to say more? 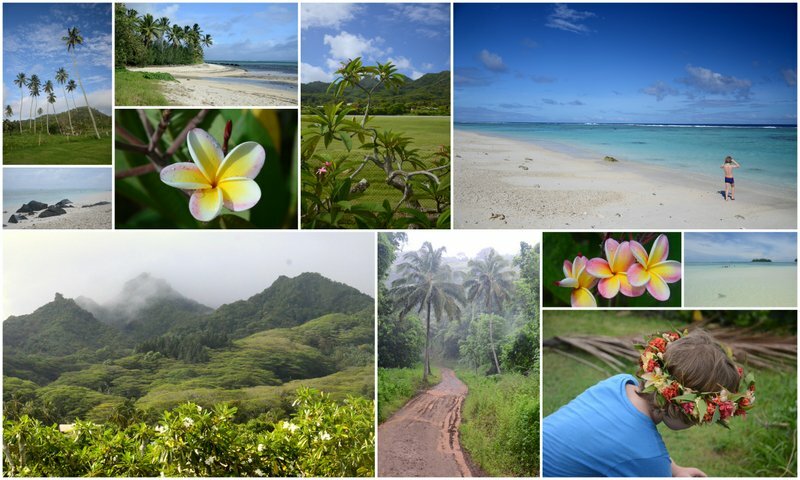 And there is so much more to this island than just these gorgeous beaches. After 5 DAYS HERE, we were IN LOVE WITH THIS PLACE and it was really hard to leave. I truly hope it stays as pristine and magical as it is and doesn´t get built-up with big hotels. We had a spare couple of days to spend on Efate before flying back to FIJI and onwards to AUCKLAND. After just a short flight from Espiritu Santo we were back to the PORT VILA airport, which we by now really knew well haha. We decided to splurge on a better HOTEL for the LAST NIGHTS IN VANUATU. We had a room with a BALCONY & SEA VIEW. A POOL. A fancy restaurant. Mom had some mojitos. And a manicure. When we arrived here from Fiji, we did not see much of the island, because we flew out again the next day, but now we had time to explore some more. 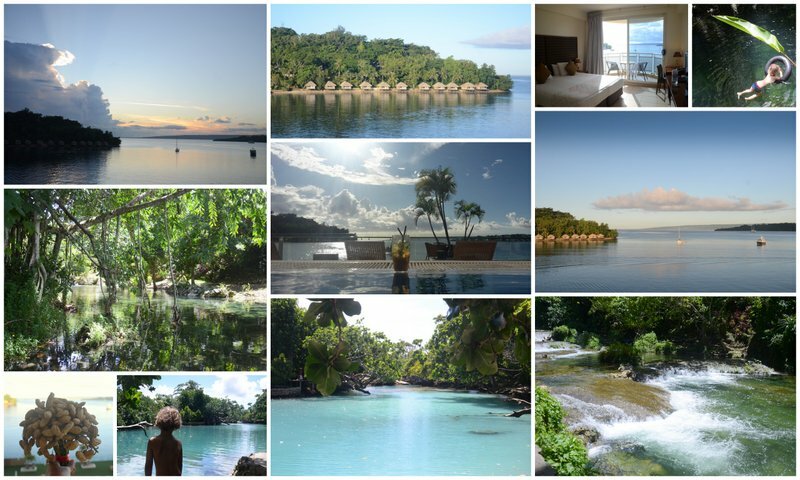 We DROVE AROUND THE ISLAND and made a few stops, but i have to say, we were much under the influence of all the wonderful experiences we had the last 2 weeks that we could not believe Efate could top this. And it didn´t. It is still a wonderful island, don´t get me wrong. 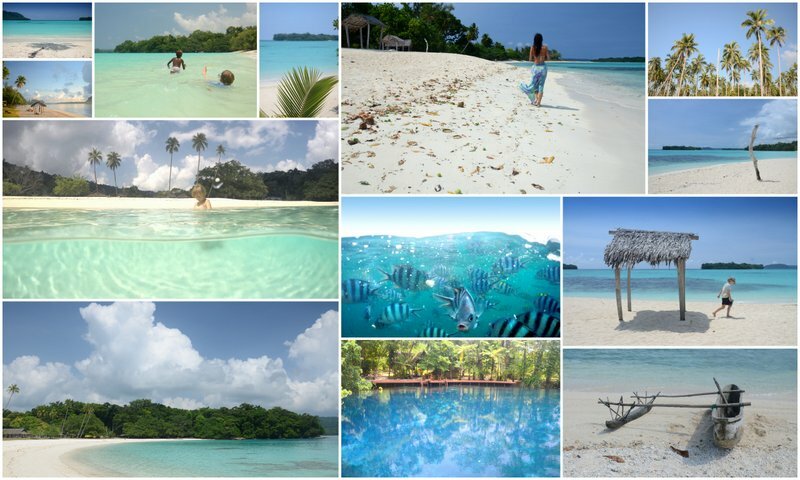 We found some great SNORKELLING spots, refreshing WATERFALLS and more BLUE HOLES. PORT VILLA is quite a lively town with lots to do, even some great DUTY FREE SHOPPING. We spent our last money in the fabulous FOOD MARKET. Well. Don´t know how to describe this. I will try to keep it short – due to BAD WEATHER one day and TECHNICAL PLANE PROBLEMS problems the second day, we were UNABLE TO DEPART Vanuatu for 3 days in a row. That resulted in MISSING OUR ORIGINAL FLIGHT BACK TO EUROPE endless phone calls and flight ticket agencies in Port Vila. 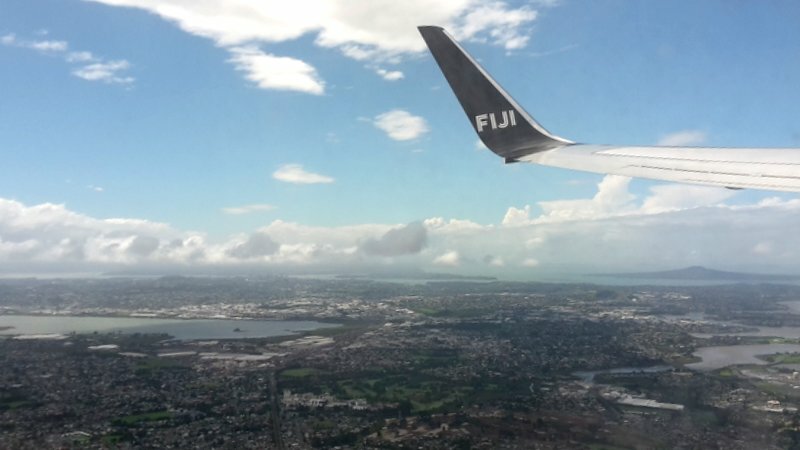 Finally we made it to Nadi, FIJI, where we spend the night and flew to AUCKLAND the next day. I should have already been back to work. But nope. Had to extend the already long holiday. As great as this might sound to you right now, it was not that great really. 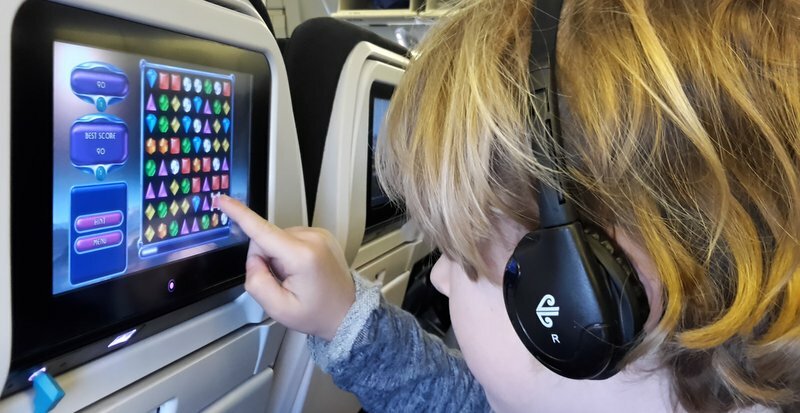 It cost us a lot of nerves and a lot of EXTRA MONEY because not all of our flights were not connected and we had to for the flights from Auckland to Europe. 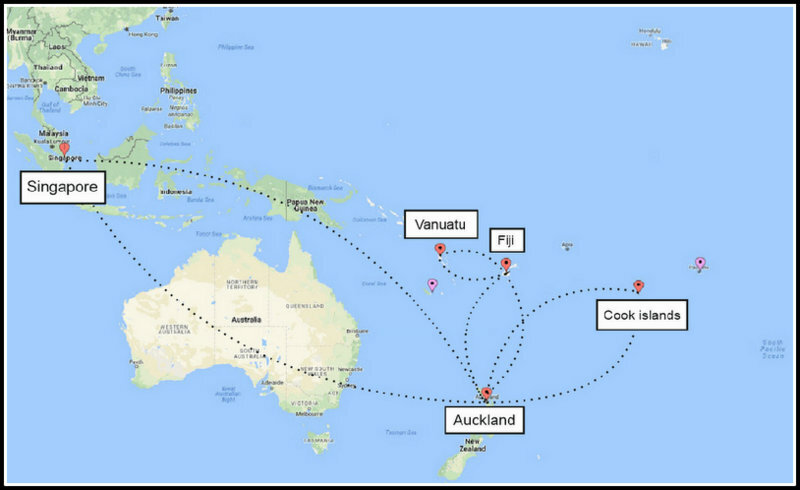 So if you are in the South Pacific DURING THE WET SEASON, do calculate a looot of extra time between flights. I thought 3 days will be enough, but obviously not. Oh well, here we were. A bit unexpectedly. 2 DAYS. We searched for hotels while still at the airport. And you know what. We were so tired from the last days and we did not want to end this awesome trip with a bitter taste. So we got a very EXPENSIVE HOTEL down town, which was a bit discounted hence the last-minute booking. Took the BUS INTO TOWN, we knew Auckland a bit from last year´s visit. Walked in to the reception in smelly clothes and a dirty backpack. We certainly did not fit in the scene. But who cares. Got a couple of strange looks and the key to the room. And wow what a room it was! The bed! The view! The mini bar! The shower! Fast internet! Still, we felt like we should go out. We walked to the MARINA. 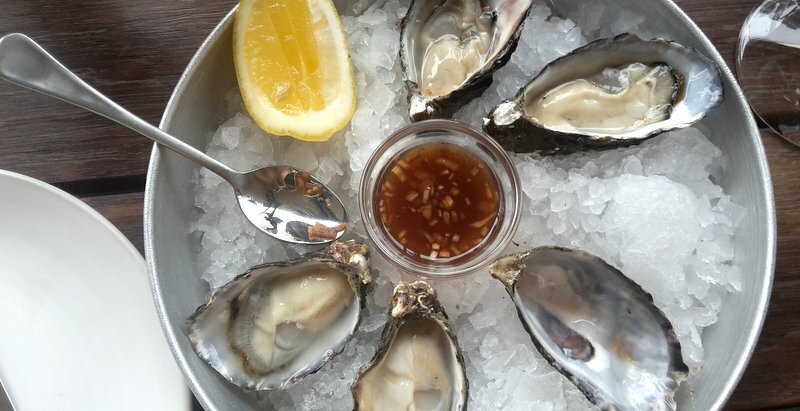 And had some OYSTERS with white WINE. Double the portion. For mom of course. Lu had unlimited ICE CREAM. That felt good. And then we went SHOPPING. Since we did not do a lot of that during the whole trip. 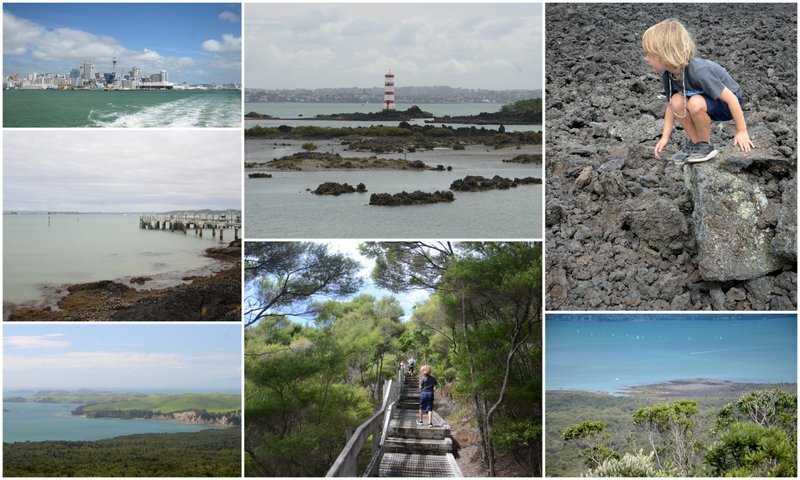 The next day we decided to do a day trip to RANGITOTO ISLAND. We have already been to the beautiful WAIHEKE ISLAND a year before and we knew Auckland quite good too, so Rangitoto sounded like a good plan. It is a VOLCANO ISLAND and you can hike up to the top – spectacular views on the Auckland bay area. It was so nice to see the green hills and islands around. It really is a special kind of green, I call it the “new-zealand-green”. A lovely dinner and DRIVE TO THE AIRPORT. Now we FINISHED THE TRIP IN STYLE. Well, almost finished. We still had a long way home. Before we knew it we were on the FLIGHT TO SINGAPORE, a bit happy to finally be on the way, after 5 days delay, but also a bit sad to leave. In that moment I would gladly accept another month or two of hopping islands. Our layover in Singapore was quite short, we got some yummy Indian food at CHANGI AIRPORT and boarded the LAST PLANE, to FRANKFURT. Due to the late evening arrival we decided to stay one more night at the AIRPORT HOTEL there and take the 3 HOURS TRAIN back home the following day. It was freezing cold, we were tired, we had to go to kindergarten / work the next day and we were already missing the tropical paradise we just left. But, there were different nice things to be happy about being back home, so we focused on those :). We travelled with one 42L BACKPACK and a smaller one for Lu. In total we had around 15kg OF LUGGAGE at the end of the trip. We carried a small laptop, a lens camera, a goPro, snorkel masks, two light towels, a pareo, flip flops and reef shoes, a small ball for Lu, mini board games and cards, basic cosmetics and just the clothes we really needed. Some days we spent quite a lot of money, some days we spent almost none. We stayed at very basic places with common toilets as well as in some very good hotels. Sometimes we just had a banana for dinner and sometimes we had a lobster. Overall IT WAS NOT THE CHEAPEST TRIP YOU CAN IMAGINE, but it was more than worth the money. THE BEST THING ABOUT THIS TRIP? Being together with Lu 24/7. This is definitely something you cannot achieve back home, where everyone is caught up in the busy daily routine. Seeing him growing up with very limited internet access, soaking up all these new places and cultures, running barefoot through the forest, eating new food, rolling in the sand with the local boys and possibly meeting his first “summer crush”. And all of this becoming his routine and not just a 2-week long holiday break. Even though I would have killed for 5 minutes of peace sometimes. Now that I look back at it, I´m so happy we did this together, just me and him. It felt incredible being a team for so long and I think it made us feel even closer. MORE POSTS, PHOTOS AND USEFUL INFORMATION ABOUT ALL THE ISLANDS & PLACES WE VISITED ON THIS TRIP IS COMING UP SOON.